The judgment of former News of the World editor Andy Coulson’s legal action against News Group Newspapers is due to be handed down at 2pm. Coulson took action against the publisher of the now-closed News of the World over payment of his legal fees. Earlier today private investigator Glenn Mulcaire won his legal fees case against NGN. This entry was posted in Legal and tagged Andy Coulson, Legal, legal fees, News Group Newspapers on December 21, 2011 by Rachel Bartlett. As the world of journalism waited with bated breath for Boris Johnson to get his 2pm press conference underway the rumours of a John Yates departure were confirmed. The assistant commissioner of the Metropolitan Police resigned after the Metropolitan Police Authority decided to suspend him pending a referral to the Independent Police Complaints Commission. Yates’ resignation comes after questions were raised about his relationship with Neil Wallis, the former executive editor of the News of the World. Wallis was arrested last week by officers investigating allegations of phone hacking. London’s mayor was questioned by a number of journalists at the press conference at City Hall, London, and some of his responses are below. Did you demand Sir Paul Stephenson’s resignation? In an ideal world Paul Stephenson would still be commissioner of the Metropolitan Police Service… The trouble was that he had been caught up in a series of decisions relating to the Met’s handing of the News of the World which were going to be extremely distracting. What Paul really couldn’t face was the idea of this protracted inquiry… at a time when he wanted to concentrate on policing in London. Of course I was reluctant … but I accept the force of that argument. Do you regret praising Rupert Murdoch around the time the Milly Dowler relevations first broke? Well, clearly what the News of the World did was absolutely loathsome and I condemn it – I’m very glad that this gives everybody the opp to get to the bottom of practices across Fleet Street. Should David Cameron walk over the hiring of Andy Coulson? I’m not here to discuss government appointments. Those questions you must address to government. I don’t think there’s a very clear read across” [from Sir Paul Stephenson hiring Neil Wallis to Mr Cameron hiring Andy Coulson]. This is a matter you must address to No 10 Downing Street. Twitter was in a frenzy before Yates’ resignation was announced. Below is a Storify of the immediate reaction. This entry was posted in Journalism, Legal, Newspapers and tagged Andy Coulson, Boris Johnson, David Cameron, News International, News of the World, phone hacking, Rupert Murdoch, Sir Paul Stephenson on July 18, 2011 by Andy Halls. An interactive timeline, starting in March 2003 when Rebekah Brooks (then Wade) speaks about paying police for stories to a committee of MPs. It features an hour by hour account of events this week and includes the Guardian revealing how Milly Dowler’s phone was hacked, further allegations of cases, the pulling out of advertisers, yesterday’s announcement that the News of the World is to close and today’s arrests. Phone hacking and the end of News of the World on Dipity. This entry was posted in Newspapers, Press freedom and ethics and tagged Andy Coulson, clive goodman, dipity timelines, News of the World, phone hacking, Rebekah Brooks on July 8, 2011 by Sarah Marshall. The morning after the announcement that News International is to scrap the News of the World has predictably spawned a variety of reaction from the blogosphere. Despite rumours that folding the newspaper in favour of a seven day Sun had been on the cards for a while (TheSunOnSunday.co.uk, TheSunOnSunday.com and SunOnSunday.co.uk were all registered on July 5, albeit by a private individual), a source at News International confirmed today that a Sunday edition of the paper wouldn’t be on the cards for several weeks to come. This morning Times today led with a story that the collapse in advertising was due to online protest and the final nail in the coffin for the paper. The withdrawal of advertising appeared to be in response to a public backlash that had been led primarily on the internet. Thousands of people had used Twitter and Facebook to express their outrage at allegations of phone hacking at the paper. This was after a list of the News of the World’s advertising clients had been published online, encouraging people to send Twitter messages to the companies to express concern at the activities of the paper’s journalists. You can read the full article here (behind the paywall). Emily Bell, director of the Tow Centre for Digital Journalism and former director of digital content for Guardian News & Media sees the decision as part of a long line of bold and audacious moves from the Murdochs, from the bid to buy the Times, to the launch of Sky News, and recently the proposed takeover of BSkyB. James’s Wapping moment sees him making a gesture he hopes will be grand enough to soften the focus of any phone-hacking inquiry, bold enough to allow the company to extricate itself from present trouble and, in the process, allow him to reshape News International around the digital television platforms he feels both more comfortable with and which are undoubtedly more profitable. For be in no doubt: hateful as the behaviour of some journalists has been, we may now face something even worse. For many in power, or previously in power, the News of the World’s crimes are a God-given opening to diminish one of the greatest checks on that power: the media. Regulation was also on Alan Rusbridger‘s mind yesterday, when he took part in a live Q & A regarding phone hacking (before NI announced the News of the World’s closure). Rusbridger drew attention to alleged weaknesses of the PCC (the code committee of which Rusbridger quit in November 2009) and the quandary of state v self-regulation. Today the Press Complaints Commission sought to defend its work following calls for it to be scrapped by both Labour leader Ed Miliband and prime minister David Cameron. This hasn’t been a wonderful advertisement for self-regulation. The short answer is that, no, the PCC can’t go on as it is. Its credibility is hanging by a thread. We did say this back in November 2009 when the PCC came out with its laughable report into phone-hacking. We said in an editorial that this was a dangerous day for press regulation – and so it’s turned out. The PCC has this week withdrawn that report and has a team looking at the issues and at the mistakes it’s made in the past. I don’t know how Ofcom could do the job without falling into the category of statutory regulation. Does anyone else? On her blog former Channel 4 presenter Samira Ahmed also draws some comparisons with the past, saying that the affair is “only my second major moral outcry against the news media” during her twenty years in journalism, the first being the death of Princess Diana. Hugh Grant has won public approval over the last week or so because of his overt opposition to phonehacking, but Ahmed is wary of putting people like Grant on a pedestal. Many celebrities understand the privacy trade-off with press coverage, or get their lawyers to settle a payoff. Incidentally we should be wary of deifying celebrities, such as Hugh Grant, who have publicly defended the principle of rich people taking out superinjunctions to cover up their bad behaviour, when there might be a legitimate public interest. But I’ve met ordinary people over the years whose suffering has been deeply compounded by salacious press intrusion. This entry was posted in Job losses, Legal, Newspapers, Press freedom and ethics and tagged Alan Rusbridger, Andy Coulson, coulson, James Murdoch, murdoch, News International, News of the World, notw, phone hacking, Rupert Murdoch, The Guardian, The Sun on July 8, 2011 by Joseph Stashko. 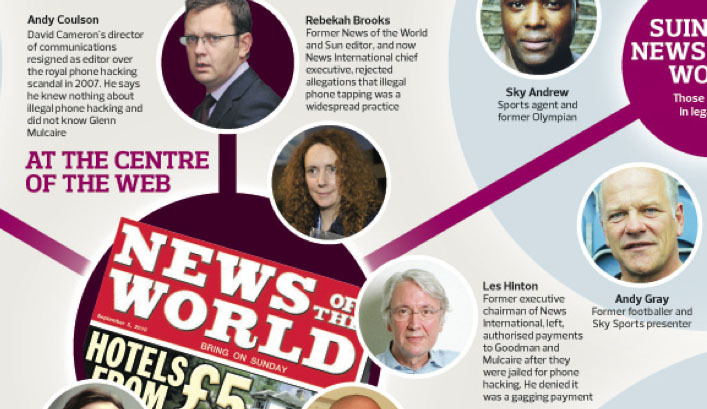 Ian Burrell, the Independent’s media editor, provides further insight into the close relationship between Rebekah Brooks and Andy Coulson, both former News of the World editors and both caught up in the ongoing phone-hacking affair. He discusses Brooks’ 2003 admission to MPs that the paper had illegally paid police officers for information. Eight years on and this week Brooks has denied knowledge of specific payments. I was there that day in March 2003 and saw Brooks (then Rebekah Wade) arrive in apparent high spirits, joking with Coulson and Piers Morgan, editor of the rival Daily Mirror but an old friend. All three had sat in the editor’s chair at the News of the World. All three would tell MPs that press regulation was working just fine. Morgan said tabloid reporters had not been so well behaved in 15 years; Brooks that the PCC had “changed the culture in every newsroom in the land”. Then she admitted paying the police. Ian Hargreaves, a former editor of the Financial Times, later commented that she had “clip-clopped into a big hole in the ground”. Her error seemed borne of a lack of experience in the political arena and intoxication with the power of the tabloid press in which she had spent her working life (she tried to put MP Chris Bryant in his place by reminding him she had 10 million readers). Burrell then brings us up-to-date, following recent arrests and News International’s apology. With two more of Coulson’s senior staff being arrested by police and one of them sacked by NI, his previous claim to have been let down by a single rogue reporter is thoroughly discredited. MPs, including Bryant, are furious that, eight years on, they still haven’t been told the truth about tabloid intrusion. The Operation Weeting team, investigating phone hacking, wants to speak to Brooks about NI’s past behaviour. Those inseparable pals, Rebekah and Andy, both remain in the gun sights – and this time neither seems capable of pulling the other out of the line of fire. Ian Burrell’s full comment is at this link. This entry was posted in Editors' pick, Newspapers, Press freedom and ethics and tagged Andy Coulson, ian burrell, Independent, phone hacking, Rebekah Brooks on April 13, 2011 by Sarah Marshall. Hugh Grant secretly recorded a conversation with former News of the World deputy features editor Paul McMullen, during which the reporter claimed that former NotW editor Rebekah Brooks “absolutely” knew about illegal phone hacking. The revelation appears in an article Grant has written for the New Statesman, which is guest-edited this week by the actor’s former partner Jemima Khan. Grant, who believes he was himself a victim of phone hacking, ended up talking to McMullan when his “midlife crisis car” broke down in a Kent village just before Christmas and he was forced to accept a lift from the reporter, who was following him. He was Paul McMullan, one of two ex-NoW hacks who had blown the whistle (in the Guardian and on Channel 4’s Dispatches) on the full extent of phone-hacking at the paper, particularly under its former editor Andy Coulson. This was interesting, as I had been a victim – a fact he confirmed as we drove along. He also had an unusual defence of the practice: that phone hacking was a price you had to pay for living in a free society. I asked how that worked exactly, but we ran out of time, and next thing we had arrived and he was asking me if I would pose for a photo with him, “not for publication, just for the wall of the pub”. So Grant returned to the the Castle Inn Pub in Dover wearing a hidden microphone, and the fruits of his chat with McMullan will be published in this week’s New Statesman. An edited version is at this link. This entry was posted in Editors' pick, Newspapers, Press freedom and ethics and tagged Andy Coulson, Daily Mail, Hugh Grant, New Statesman, News International, News of the World, Paul McMullan, phone hacking, Rebekah Brooks, Rebekah Wade on April 7, 2011 by Sarah Marshall. Media commentator Roy Greenslade has taken a look at the newspapers’ response to the resignation of Downing Street director of communications Andy Coulson on Friday. Coulson, a former editor of the News of the World, cited the continued pressure from coverage of the phone-hacking scandal as the reason for his departure. One of the government’s key aides departed amid controversy on Friday. So how did the weekend’s press cover the story of the resignation of Andy Coulson, No 10’s director of communications? Full post on Greenslade’s blog at this link. This entry was posted in Editors' pick, Newspapers, Politics, Press freedom and ethics and tagged Andy Coulson, downing streeet, News of the World, phone hacking, Roy Greenslade, The Guardian on January 24, 2011 by Joel Gunter. Calls for a police enquiry are mounting following the resignation yesterday of Downing Street communications chief Andy Coulson. Coulson said that the continued coverage of the phone-hacking scandal surrounding the News of the World, where he was editor from 2003 until 2007, was making his job at No 10 impossible. Read the full story plus other video interviews with Guardian editor Alan Rusbridger, ex News of the World editor Phil Hall and former News of the World journalist Paul McMullan. This entry was posted in Legal, Newspapers, Press freedom and ethics and tagged Alan Rusbridger, Andy Coulson, Downing Street, News Corporation, News International, News of the World on January 22, 2011 by John Thompson. Tonight’s Channel 4 News will be extended to an hour following the resignation of David Cameron’s director of communications Andy Coulson and Tony Blair’s appearance at the Iraq Inquiry. Coulson resigned over continued coverage of phone-hacking that took place under his editorship of the News of the World. Presenter Krishnan Guru-Murthy announced the extended bulletin on Twitter, following a previous comment that there was to be “an unusually exciting Friday night’s channel 4 news ahead”. Meanwhile, following Coulson’s resignation, Guru-Murthy’s co-presenter Jon Snow alleged that he believes his own phone was hacked with the involvement of another, unamed, newspaper. This entry was posted in Broadcasting, Editors' pick, Politics, Press freedom and ethics and tagged Andy Coulson, Channel 4 News, Jon Snow, News of the World, phone hacking on January 21, 2011 by Rachel Bartlett. As the CPS begins a fresh assessment of Met police evidence in the News of the World phone-hacking case, and coverage of the convoluted scandal is once again on the rise, the Observer has produced a graphic for the confused, showing how the major players fit together. See the full graphic at this link [PDF]. This entry was posted in Editors' pick, Newspapers, Politics, Press freedom and ethics and tagged Andy Coulson, News of the World, phone hacking, The Observer on January 17, 2011 by Joel Gunter.